Whoopie Pies Recipe Test | eat. write. smile. Everyone loves cupcakes these days. I’m guilty of buying a $5 mini-cupcake with all local organic ingredients from Kara’s Cupcakes. They are so ubiquitous that they substitute for cake at weddings- “everyone gets a beautiful little cupcake. ” However, there is something a little dressed-up, a little too precious about them. I just admitted my bias by saying “guilty of…” because deep down I know it’s ridiculous to pay $5 for a small sweet unless you’re sitting in a ballpark. And even then it stings. Last week’s New York Times Dining section has suggested the new cupcake, albeit humbler but just as tasty: the whoopie pie. 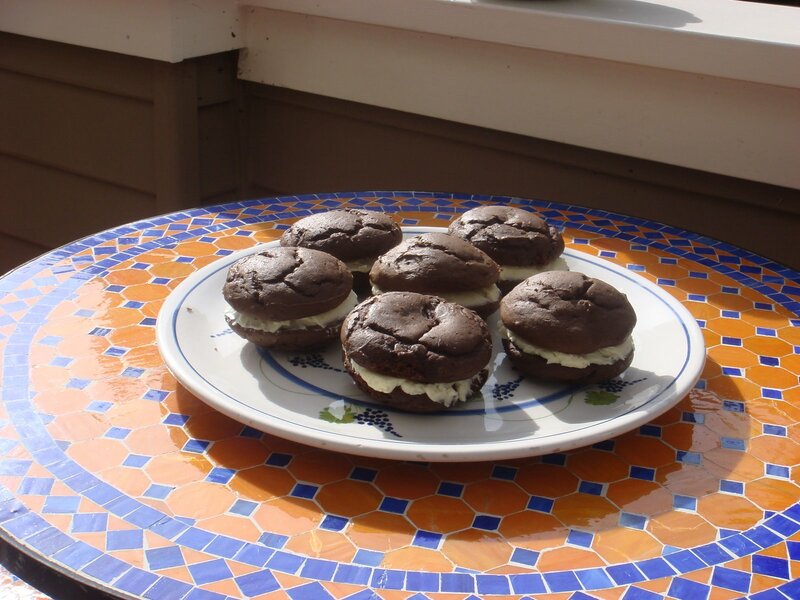 Not likely to be found in a posh bakery in The Marina in San Francisco, the whoopie pie tends to pop up on gas station counters in Maine or in baskets by the check out at the WaWa in Pennsylvania. I had never tried one, nor had I ever considered making a batch. Until I saw this article. Oh, the NY Times food stylist had me with the glass cake platter and the descriptions of rich buttercream filling. I went for it. The recipe says it takes one hour to make these little guys, but it took this novice a bit longer. Making buttercream filling (similar to frosting) from scratch takes a while. Don’t be discouraged by the mention of double boilers and thermometers- you can improvise with a metal bowl over a regular pot. Also, just observe the egg-and-sugar mixture until the sugar is melted, no need for the technical complication of a thermometer at 180 degrees. You can use a regular hand-held mixer, not a heavy duty stand up mixer, but yes, it takes a little longer. Also, there are two sticks of butter in the aptly named buttercream filling, but I would recommend cutting that down. Instead of using the full 16 tbsp, I will probably use 10-12 tbsp. Since the butter is added incrementally, you can choose how much to use. In hindsight, the buttercream was already rich, smooth and creamy by about 12 tbsp. The chocolate cakes are a delight to make, springy and barely sweet. They are as moist as a rum-soaked cake, but as fluffy as angel food. A difficult consistency to describe, but a delight on the palate. They didn’t turn out perfect: some of the chocolate tops were massive, others were flat discs, the buttercream filling was a bit too buttery. However, they were a crowd-pleaser and I would be proud to serve them again as a dessert to make guests feel special. Though they have no raspberry filling, no espresso-infused cake, no lemon-scented egg whites or whatever, whoopie pies are just black and white- and simply delicious. A friend, former roommate and culinary enthusiast Jordan Rundell, told me last night “This is the best thing you’ve ever made for me.” I’ll take it. What could be better than making a tasty, novel dessert? Enjoying it with your friends. 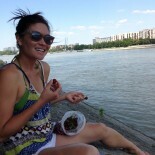 This entry was posted on March 26, 2009 by Ruthie in Uncategorized.